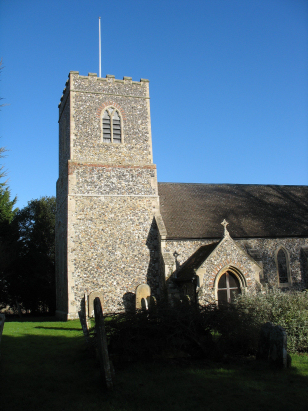 The parish of East Carleton lies just southwest of the city of Norwich, about 5 miles southwest of the city and just east of the main A11 road linking Norwich with London. East Carleton is a rather dispersed settlement with no village centre to mention, it lies in a group of lanes just northwest of the larger village of Mulbarton. The parish has numerous scattered farms and cottages and a relatively small area of housing around the major junction. The parish is dominated by the grounds of the manor which probably is indicative of a former "closed" parish. St Mary's church is set back from the major east-west lane almost in the grounds of the manor. 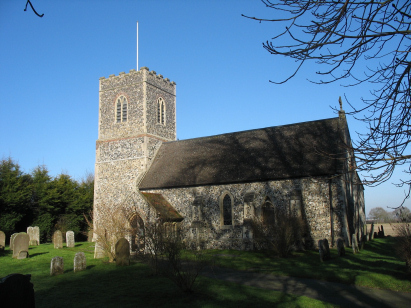 It is an early church with many 13th century Decorated features. Much, however, is masked by a major renovation in 1881 which rebuilt the tower and restored and altered much of the rest. A single standard 800-entry register book covers the period of the transcript and continues onwards beyond to 1916. This register is filmed on Microfiche 4 in the collection of the Norfolk Record Office. The fiche is rather elderly and suffers from poor quality images, however the register must have been well preserved as despite the poor fiche this proved relatively straightforward to read (handwriting sometimes an exception). Hopefully this has been accurately transcribed and few errors introduced.